A video of Governor Scott. 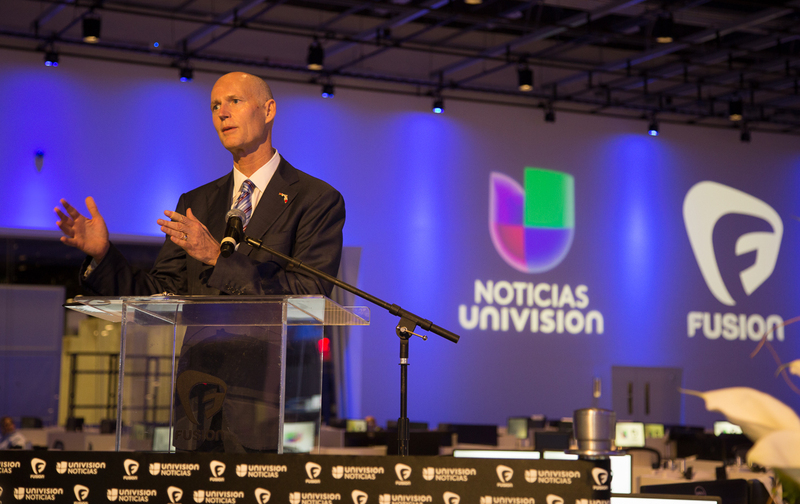 Today, Governor Rick Scott announced the opening of Newsport, the new state-of-the-art facility that will be home to Noticias Univision and Fusion networks, in Miami. Governor Scott participated in the ribbon cutting ceremony signaling the opening of Newsport that will create new jobs for Florida families. Univision Communications Inc., UCI is the leading media company serving Hispanic America. Its assets include Univision Network, one of the top five networks in the U.S. regardless of language and the most-watched Spanish-language broadcast television network in the country reaching 96% of U.S. Hispanic households; UniMás, a leading Spanish-language broadcast television network reaching 89% of U.S. Hispanic households; Univision Cable Networks, including Galavisión, the country’s leading Spanish-language cable network, as well as Univision tlnovelas, a 24-hour cable network dedicated to novelas, Univision Deportes Network, a 24-hour cable network dedicated to sports, ForoTV, a 24-hour Spanish-language cable network dedicated to news, and an additional suite of six cable offerings – De Película, De Película Clásico, Bandamax, Ritmoson, Telehit and Distrito Comedia; UVideos, the first bilingual digital network serving Hispanic America; Univision Studios, which produces and co-produces reality shows, dramatic series and other programming formats for the Company’s platforms; Univision Television Group, which owns and/or operates 62 television stations in major U.S. Hispanic markets and Puerto Rico; Univision Radio, the leading Hispanic radio group which owns and/or operates 69 radio stations in 16 of the top 25 U.S. Hispanic markets and Puerto Rico; Univision Interactive, a network of products and offerings including Univision.com, which continues to be the No. 1 most-visited Spanish-language website among U.S. online Hispanics, Univision Móvil, a longstanding industry-leader with unique, relevant mobile products and services, and Univision Partner Group, a specialized advertising and publisher network. Headquartered in New York City, UCI has television network operations in Miami and television and radio stations and sales offices in major cities throughout the United States. For more information, please visit Univision.net. In Florida, Univision has reported it employs 2,962 people at an average wage of $95,000. On May 7, 2012, Univision News and ABC News announced they would launch a 24- hour news, lifestyle and entertainment network dedicated to informing and inspiring Latinos and millennials, the most exciting, fastest-growing group of young people in America. Six major distributors have already agreed to carry Fusion, including Cablevision, Charter, Cox, AT&T U-Verse, Verizon FiOS and Google Fiber. It launches on air October 28, 2013, and you can follow online now at @ThisIsFusion.